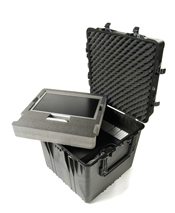 With a watertight, crushproof, and dust proof construction, Pelican cases represent the ideal option for shipping computers and monitors. Many of the larger models include retractable extension handles and strong polyurethane wheels to make transport quick and easy. 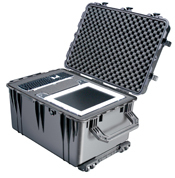 Read more about the advantages of Pelican Cases. UFP Technologies offers the ultimate protection with our custom foam insert solutions. We can design and fabricate a foam insert designed specifically for your computer, keyboard, monitor and accessories. Pelican offers standard convoluted foam lids and Pick 'N' Pluck foam inserts that can be manually configured to provide interior protection for most computers. Numerous cases are also available that are sized perfectly for many of today’s more popular monitor sizes. We’ll find the right size for your particular monitor and create a custom foam insert to ensure its safety during transit. 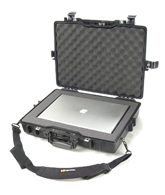 Pelican also manufactures a full line of laptop cases that include padded shoulder straps, lid organizers, and locks.